You will need Python 3.7 installed on your machine. In this tutorial, we will look at how to add Google reCAPTCHA v2 to a registration form in Flask. We will build a Flask app which simply allows users to register, ticking within the reCAPTCHA box to ensure it's not a robot requesting to register. Google reCAPTCHA is a service that protects websites from spam and abuse. This tutorial assumes you have basic knowledge in Flask, Python and you know how to navigate your operating system's command line and configure your development environment. In order to integrate Google reCAPTCHA in a Flask-based app, we need to register a site and get an API key pair . Google provides four types of reCAPTCHA. reCAPTCHA v3 validates requests with a score whilst v2 validates request with the "I am not a robot" checkbox. The Invisible reCAPTCHA does not need the user to click on a check box instead it is called upon when a user clicks on a button on a site. In this tutorial let's make use of reCAPTCHA v2 to validate request in a Flask app. Browse to Google and sign up or login with your Google account. Click on the My reCAPTCHA blue button to register a site to use reCAPTCHA. Choose the type of reCAPTCHA you want to use. Choose the reCAPTCHA v2 purposely for this tutorial. We need to install virtualenv via pip before we can go ahead to create a virtualized environment for this project. Next create a directory to hold the virtualized environment with the mkdir command. The second package we have installed with pip is an integration of Flask and WTForms including CSRF, file upload and reCAPTCHA. On the first line, we imported Form and RecaptchaField from flask_wtf. Next we imported TextField , PasswordField, TextAreaField, StringField , and validatorsfrom wtforms . Under the Class RegisterForm, we have form fields such as StringField, and PasswordField. Each field represents a specific data type and contain a number of properties such as a label and description. Inside the app. py file , import Flask, render_template and request from flask . render_template will make it possible for us to display the registration form to those who navigate to the register section. In addition, import the RegisterForm class via the form file. Afterwards create view method for our registration form. return "the form has been submitted. Success!" In the app.py file, add your Google reCAPTCHA keys. You need to place reCAPTCHA configuration settings below app = Flask(__name__). In the project directory, create a sub-directory using the mkdir command and name it templates. We will place the registration HTML file inside the templates directory. You can create HTML files in the templates by using the touch command. 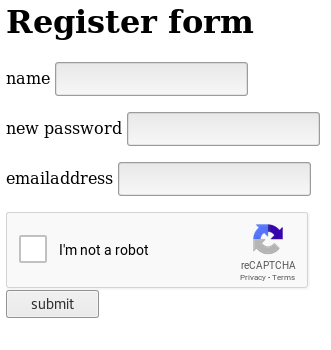 The register.html file will be used to displayed registration form integrated with Google reCAPTCHA by the render_template method . We will make use of Jinja templates to do so. This page below will be displayed to users who navigate to the register section. In this tutorial, we leverage on flask_wtf to integrate Google reCAPTCHA in Flask. Because the primary purpose of the tutorial is to show users how to integrate Google reCAPTCHA in Flask, we did not place much emphasis on the user interface. The code is available in GitHub. You can clone it to see how it works.